The Gladiator movie (2000) starring Russell Crowe is a movie that needs no introduction. It won multiple awards and was a big success at the box office. It is a great historical epic, the story of a popular Roman general turned gladiator. The Gladiator movie starts with an amazing battle scene with Roman troops fighting the barbarian tribes in Germania. The well-equipped and well-organized Roman troops face the barbarians in the forest when General Maximus Decimus Meridius (played by Russell Crowe) gives the command to "unleash hell". Much of the plot is fiction and most of the characters in the movie are fictional, noting however that filmmakers paid a lot of attention to historical and cultural details. Some of the characters in the movie did exist in history including Commodus (reign: 180 - 192 A.D.) and Marcus Aurelius (full name: Caesar Marcus Aurelius Antoninus Augustus, reign: 161 - 180 A.D.). Commodus (played by Joaquin Phoenix) was the son of emperor Marcus Aurelius (played by Richard Harris) who named him Caesar in 166 A.D. and made him co-emperor in 177 A.D.. Marcus Aurelius in the movie is different as he does not want his son to become his successor. In the movie, Commodus kills his father. Commodus was indeed with his father during the Danubian wars and when his father died but it is unclear whether he committed patricide. Some ancient historians suspect that he did because he made peace with the enemy and retreated back to Rome quickly to celebrate his victory (officially Marcus Aurelius died of the plague). Lucilla, Commodus' sister, plotted against him in history and Commodus was a decadent who did fight as a gladiator in the arena. General Maximus Decimus Meridius in the movie is fictional but brings to mind general Germanicus (15 B.C. - 19 A.D.) who was an extremely popular general and commander of the forces in Germania. Similarly, Senator Gracchus is also fictional but appears to be based on the Gracchi brothers who were tribunes acting on behalf of the plebeians. Elected in 133 B.C., the Gracchi brothers tried to pass land reform that would benefit the poor to be later killed. As we previously pointed out much of the plot is fiction but many of the characters/events depicted in the movie resemble real historical characters/events placed in the wrong chronological order. The movie's objective is clearly not to be chronologically accurate but to capture the culture and psychology of the time. The movie emphasizes values such as honor (at the beginning soldiers repeat the phrase "strength and honor"), virtue and duty, or worship of family and ancestors. Filmmakers did spend a good amount of time on historical research: the carriage that transports Commodus and his sister, the slave caravan in Mauretania, the way slaves are sold, the gladiator school or the reenactment of battles at the Colosseum are all accurately depicted. However, even though the initial battle scene is convincing, the Roman soldiers wear an armor from the 1st century A.D. and the barbarians wear clothes that are more primitive than what they were in reality. Unlike older historical epics such as Spartacus, the Gladiator movie uses computer generated imagery which renders breathtaking views of Rome, of Commodus' palace and of the Colosseum. 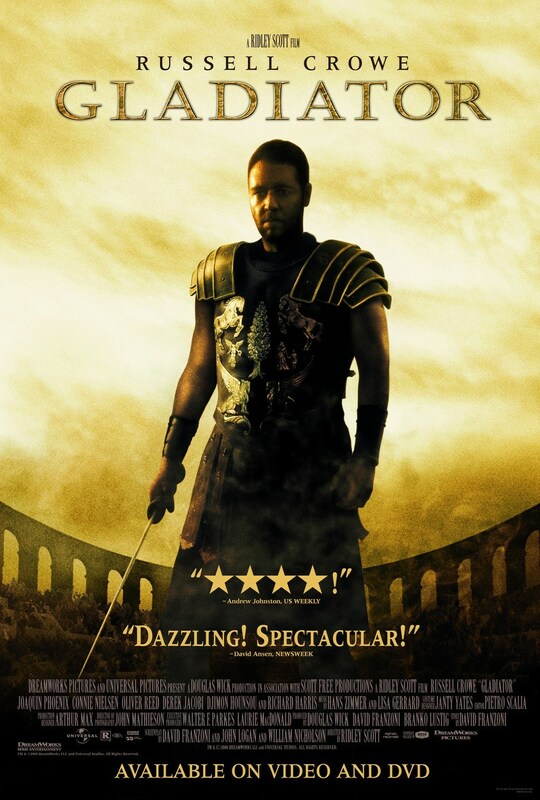 Gladiator takes elements from other movies such as Spartacus and the Fall of the Roman Empire. In the Fall of the Roman Empire, Marcus Aurelius is also presented as an emperor with ideals and Republican inclinations (he truly was such an emperor) and Commodus also kills his father Marcus Aurelius. 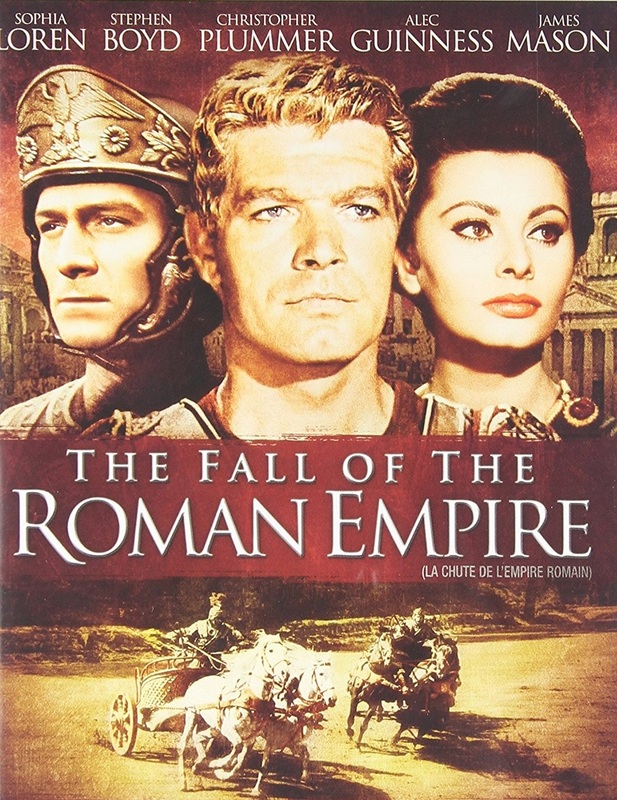 However The Fall of the Roman Empire movie goes deeper into analyzing events that led to the collapse of the Roman Empire. To conclude with, even though the plot is mostly fiction, Gladiator is a very entertaining movie that captures the culture and psychology of 2nd century Rome. 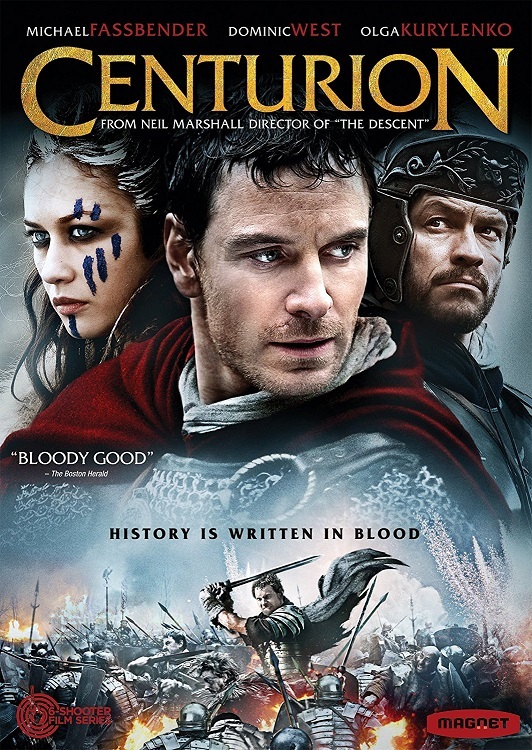 The movie is a must-have at home for Roman history buffs! Weapons: In the initial battle scene, catapults and ballistae are used. These Roman weapons were siege weapons and would probably not have been used in an open field and even less in a forest. Weapons: In the movie, catapults have a cup at the end of the arm. Roman catapults (called onagers) had a sling rather than a cup. Weapons: Roman legions used spears called pila that they would throw as the enemy closed in before drawing their swords. The pila were designed to pierce bodies or to penetrate enemy shields and to bend upon impact. In the movie, we are shown Roman soldiers holding their pila but never using them and we never see dead bodies or shields riddled with pila. Battle: In the opening battle scene, the formation of Roman soldiers collapses upon contact with the enemy. In reality, Roman legions were well-organized, they always maintained formation for mutual support and were trained to fight in regiments. Battle: Roman soldiers wear an armor from the 1st century A.D..
Battle: The barbarians wear clothes that are more primitive than what they were in reality. Language: In the movie, Marcus Aurelius is referred to as "sire" or "my lord". In reality he would have been called Imperator or Caesar, his full name being "Imperator Caesar Marcus Aurelius Antoninus Augustus". Language: When Roman soldiers go to Maximus' villa to burn it and kill his family, Maximus' son yells at his mother "Mama! I soldati!" which is Italian and not Latin. Factual error: In one of the scenes in Rome before the Colosseum fight, leaflets are being distributed. Leaflets did not exist in Ancient Rome and boards were used for event notices. Factual error: At the gladiatorial school, a gladiator is seen eating his meal with a metal spoon. Gladiators almost certainly never ate with metal spoons that they could use as weapons to attack the guards. Rather they used their fingers, wooden spoons or wads of bread. Arena fight: In the arena, Maximum fights a gladiator holding a trident. This type of gladiator was called a retarius and also fought using nets. In the movie, the retarius wears a shoulder on the right shoulder and a helmet. In reality, the shoulder armour was worn on the left shoulder because being left-handed was frown upon in Rome and he would never wear a helmet as it would give him too much of an advantage. 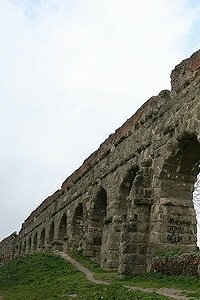 Arena fight: Women were not allowed to be with men and could only see the games from the last floor of the Colosseum. Factual error: At several points in the movie, we see horses with saddles and stirrups. The stirrup arrived in Europe from China only in the 3rd or 4th century A.D. at the earliest. Factual error: In the arena, Maximus tells the spectators and Commodus that he is the general of the Felix legions. There was only one Felix legion, namely the Legio IV Flavia Felix. Architecture: Shots of the city of Rome show architectural elements in the skyline that existed only centuries later including bell towers, balustrades and domes. Architecture: Columns are not painted which they were in Ancient Rome. Architecture: In the movie, speeches to a large crowd often take place at St Peter's Square which was built in the late Renaissance where the statues of popes can be seen. Architecture: Maximus' house is a Chianti villa from the 15th century.